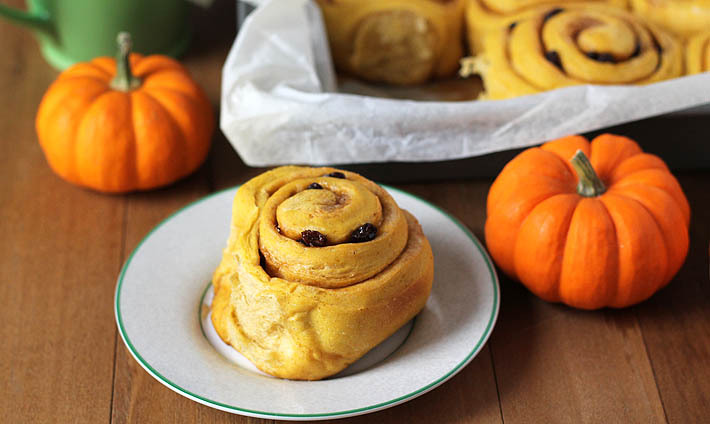 These deliciously sweet and perfectly spiced Vegan Pumpkin Cinnamon Rolls are perfect for a fall treat or for holiday entertaining! A while back, I was watching Food Network (ha! how many of my posts have started out like this?! I clearly get a lot of my recipe inspiration from that channel!) and The Pioneer Woman (aka: Ree) was making her version of pumpkin cinnamon rolls. I had to make them, and I needed to eat them, so I looked up her recipe to get an idea of what went into them so I could make a vegan version. The method I use here to make mine ended up being quite different from the one she uses to make hers. I’ve never made her version, but I’m pretty sure these are just as delicious! 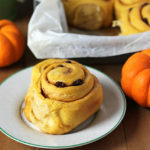 Between this recipe and my Apple Raisin Cinnamon Rolls recipe I link to above, I can’t decide which one I love best. And I’m not just saying that because they’re mine. I’ve received so many messages about those Apple Raisin Cinnamon Rolls since I shared the recipe and I’m so happy it was well-received. 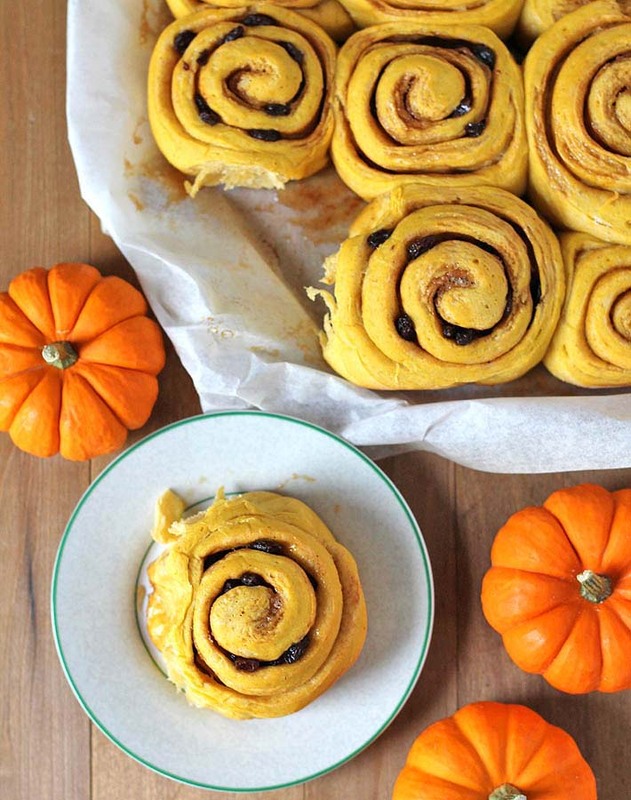 I hope the same goes for these vegan pumpkin cinnamon rolls! 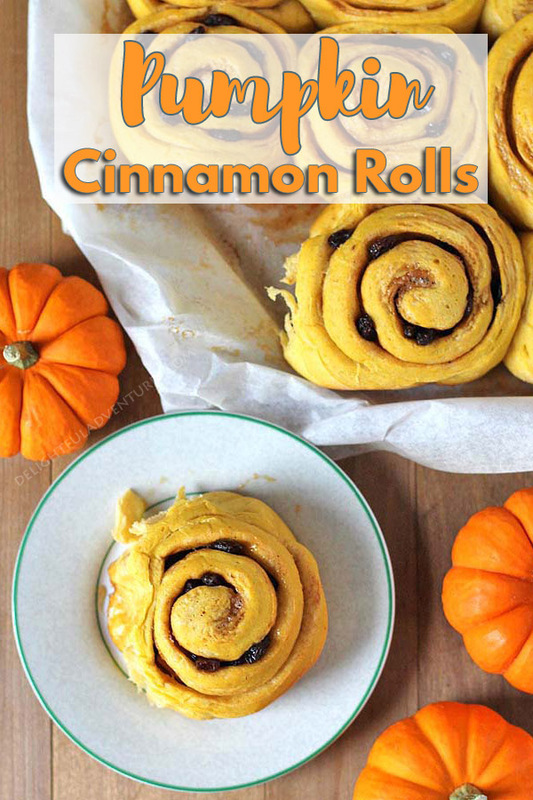 I call them vegan pumpkin cinnamon rolls but really, they’re more “pumpkin spice” rolls. I definitely use cinnamon but I also use ground nutmeg and ginger to enhance the flavour and to make them even more fitting for fall. 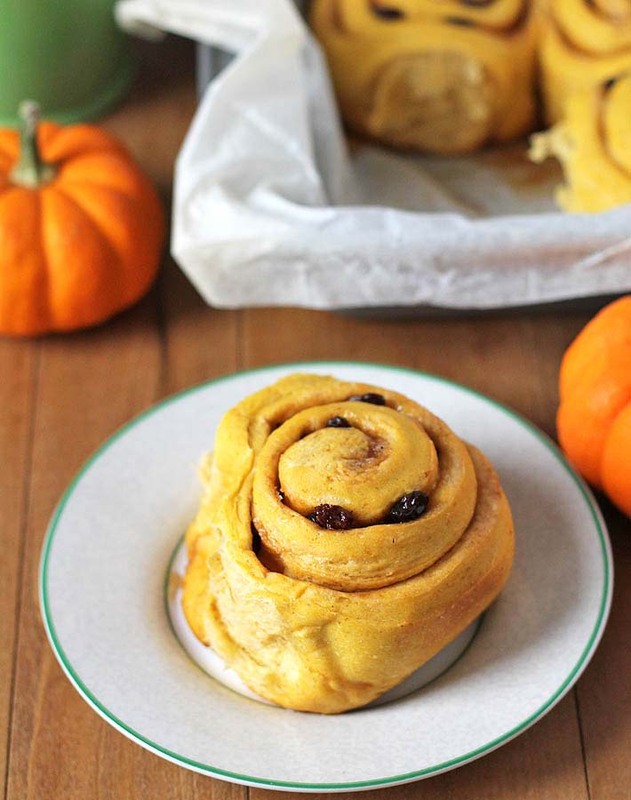 These fluffy rolls are perfect to devour during pumpkin season, for Thanksgiving, or even for Christmas. Why not? One last thing…my preference is to not to top these with a glaze, but that doesn’t mean you can’t. See the note below the recipe for a quick glaze recipe you can make. You can get a glimpse of what the glaze looks like in my Easy Vegan Cinnamon Rolls recipe. And click here for even more pumpkin recipes! 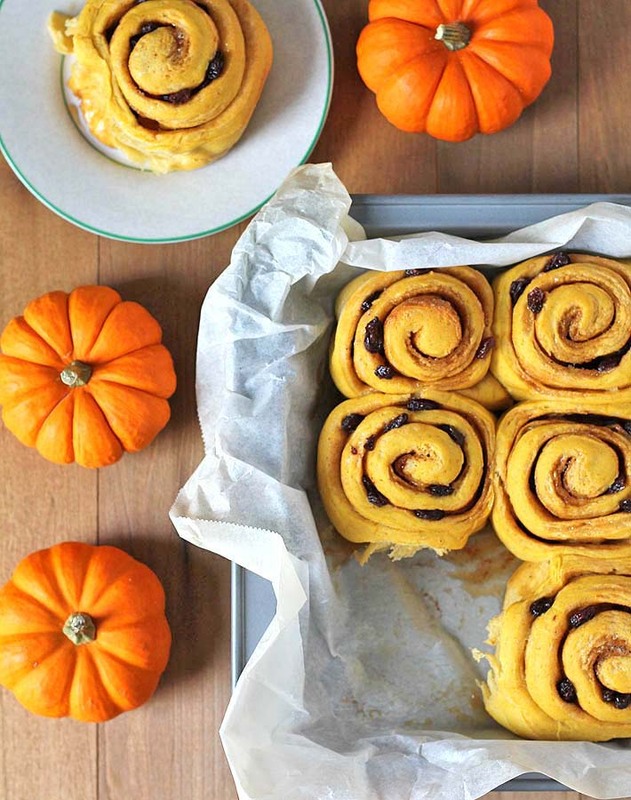 These deliciously sweet and perfectly spiced Vegan Pumpkin Cinnamon Rolls are perfect for a fall treat or for holiday entertaining. In your stand mixer bowl, add the yeast, 1 teaspoon of sugar, and lukewarm water. Let stand for a few minutes. When the yeast has foamed up, add the room temperature/lukewarm milk, pumpkin puree, oil, salt, ground cinnamon, ground nutmeg, ground ginger, sugar and 1 cup of flour. Mix with a spoon to combine. Put stand mixer bowl in place, add 2 more cups of flour and using the dough hook, allow the mixer to knead. The dough will be sticky, add flour 1/2 cup at a time. Let mixer knead dough for about 4 minutes and until enough flour has been added so it is no longer sticky. Remove dough from mixer bowl and oil the inside lightly. Place dough back in bowl, cover with a towel and let it sit in a warm spot until it has doubled in size, about 1 hour. After the hour has passed, punch the dough down and let it sit for a few minutes while you prepare the pan and filling. Line an 11" x 13" pan with parchment paper. Allow an overhang on each side so they can be easily removed from the pan when done. Prepare raisins (see tip above). In a small bowl, mix the brown sugar, ground cinnamon, ground nutmeg, and ground ginger. Lightly flour your work surface, stretch and roll your dough into a rectangle that is approximately 12" x 18". Brush melted coconut oil over the entire surface. Sprinkle brown sugar/spice mixture onto dough. Sprinkle raisins evenly onto the dough. From the long side, firmly roll the dough. Roll slowly to ensure it is tight as can be. Pinch the entire length of the seam to seal and turn the entire roll seam side down so it's at the bottom. Slice off an inch of dough from each end. Slice the roll into 12 slices. Place each slice into the parchment lined pan. It's OK if they are close together. Cover with a towel and place in a warm spot. Let rise for 30 minutes. After the rolls have rested, bake for about 20 minutes or until they are lightly browned. Remove from oven and let sit for a few minutes in pan. Remove using parchment paper overhang and place on a cooling rack. I use my stand mixer to knead the dough, if you don't have a stand mixer, knead by hand. Before you add the raisins, follow this tip to ensure they are plump and juicy! If topping with a glaze, add it while the rolls are still warm. To make a quick glaze, simply mix 1 cup of icing sugar with a 1/2 teaspoon of vanilla and non-dairy milk (add 1 1/2 tablespoons of the milk to start, mix, then continue adding very small amounts of milk at a time until it reaches the desired consistency). Add glaze just before serving. These buns are their best when served warm, but of course, you may not be able to serve all 12 while they are still warm! After they have cooled, store in an airtight container and warm up when serving again. Nutrition info is based on 1 roll and the recipe prepared as written. Nutrition info is is only to be used as a rough guide. Click to learn how nutrition info is calculated on this website. I made these last night for a special breakfast at work this morning and they were perfect. I also made an icing for them. My co-workers loved them and I now have an empty dish to bring home. Thanks for a great recipe, I will be making them again!